Assistant coach Matt Ferguson insists it doesn't matter who Saints face in the quarter-finals of the Challenge Cup after booking their place on Friday night. The black, green and gold ran riot at Franklin's Gardens, eviscerating Romanian minnows Timisoara Saracens, who were dealt a 111-3 defeat. Ollie Sleightholme scored four tries and Alex Mitchell racked up a hat-trick as Saints scored 17 tries on the night. They will progress from Pool 1 as best runners-up after Clermont Auvergne finished the group stages with a blemish-free record. Potential last-eight destinations for Saints include Sale Sharks, La Rochelle and Clermont Auvergne. They will find out who they face after Saturday's games have been completed. "To be alive in three competitions coming into the end of January is a good thing and I actually don't think it matters where we go in terms of our quarter-final," Ferguson said. "If we look at our processes that should stand us in good stead wherever you go and that's why it's important that when you review games like this you maintain those processes. 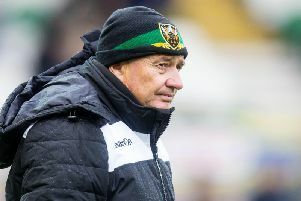 "You can't look at an eight-point defeat at Clermont as being okay and you can't look at a 100-point win against Timisoara as being brilliant. "To be in a quarter-final will be great and we will have to be more accurate in those knock-out stages." On the win against Timisoara, Ferguson said: "We had three goals from the fixture: one was five points, two was to put a score on the board to put pressure on other teams on Saturday and first and foremost, our aim was to play the brand and execute the way we're trying to play. "We'll look back and realise there are parts of the game where that didn't happen and that's not for one minute questioning the boys' desire,but we still have to retain ball better, we've still got to make better decisions, we've still got to be more accurate and we've still got to launch better. "When we come to the knock-out stages, we'll have to do that for 80 minutes to keep us in the competition."